Innova Biosciences (Innova), a specialist provider of bioconjugation products and services, today announced the launch of its Magnetic Conjugation Kit, the newest addition to the company’s range of particle conjugation technologies. The new kit allows researchers to covalently conjugate antibodies and proteins to 0.5µm magnetic particles without the need for extensive optimization of the conjugation reaction, thereby saving precious antibody or protein. 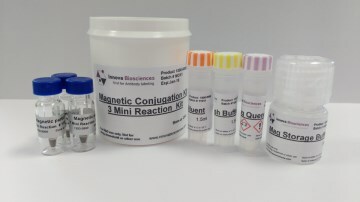 The Magnetic Conjugation Kit is ideal for use in immunoprecipitation experiments, as covalent attachment provides a more stable alternative to non-covalent antibody attachments using traditional Protein A or protein G resin. The specially treated iron oxide magnetic particles offer an ideal balance between high surface area and fast separation, providing a binding capacity that is twice that of leading competitors, allowing high sensitivity to be achieved with less material and minimizing the risk of non-specific binding. Innova Biosciences’ conjugation technologies include Lightning-Link® for antibody & protein labeling, InnovaCoat® GOLD nanoparticles and Latex beads for lateral flow, and Thunder-Link® for oligonucleotide conjugation.